In this article, we will look at the ByRef argument type mismatch error. First, let us have a look at what is ByRef and the difference between ByRef and ByVal. In Visual Basic, you can pass an argument to a procedure or function by value or by reference. This is known as the passing mechanism, and it determines whether the procedure or function can modify the variable that has been passed. The declaration of the function determines the passing mechanism for each parameter by specifying the ByVal or ByRef keyword. The advantage of passing an argument ByRef is that the procedure can return a value to the calling code through that argument. The advantage of passing an argument ByVal is that it protects a variable from being changed by the procedure. 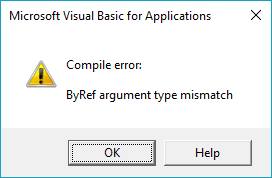 The default in VBA is to pass arguments by reference. For more details, you can refer to the article here. Case 1: You passed an argument of one type that could not be forced to the type expected. Case 2: You have not declared the variable in the calling sub. For example, this error occurs if you try to pass an Integer variable when a Long is expected. If possible, always try to match the data type. This is easiest and quickest solution. So, in our case, the amount variable should be integer (or long, based on the requirement) in both the places. Force coercion to occur by passing the argument in its own set of parentheses (even if it causes information to be lost). Placing the argument in its own set of parentheses the fractional portion of the number is rounded to make it conform to the expected argument type. The result of the evaluation is placed in a temporary location and the original amount retains its value. Pass the variable by value. For that, specify the keyword “ByVal” before the variable name in the function definition. In VB, if you declare a variable without specifying the data type, by default the variable is assigned the type “variant”. So, you need to explicitly specify the variable data type before passing it to a function. Here, VBA sets lastName as a String. However, for firstName it is a variant data type and not String. This is because in VBA, you have to specify data type for each and every variable separately (even if the variables are declared on the same line).